Foodservice Equipment & Supplies magazine's April issue featured an on-site profile of a project completed last year in Anderson, Indiana. 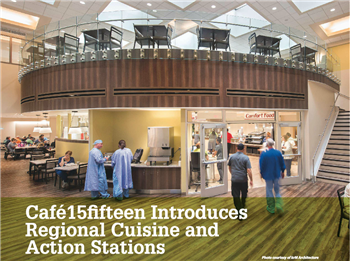 Café15fifteen is Community Hospital Anderson's new aptly named dining facility. 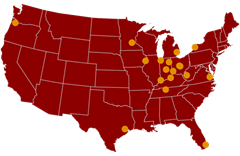 (The hospital's address is 1515 North Madison Avenue.) The kitchen and servery were in dire need of an upgrade. 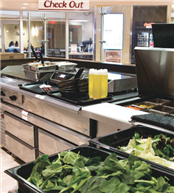 Retiano Design Group provided the design and consultant services on the project, and C&T Design Indy's Jon Ryder served as the project's foodservice equipment dealer and project manager. The renovation was completed in two phases: the kitchen first, and the servery second. Kitchens To Go set up a temporary kitchen to minimize any interruptions patients, doctors, and visitors may experience regarding the food while the construction took place. Once construction was completed, the equipment in the temporary kitchen had to be moved to the new kitchen in a matter of hours. That was one stressful night!